The TC Electronic PolyTune 3 Guitar Tuner Pedal retains the features that made the original PolyTune, and the PolyTune 2 so popular, but adds even greater performance to this highly praised series. Now with built-in buffer, tone purists can decide whether or not to utilise TC's original True Bypass or their acclaimed BonaFide Buffer, which preserves your tone's fidelity over extensive cable runs (perfect for those with elaborate pedalboards). Whether or not you're a touring professional, every guitarist cherishes their tone above all else, and the PolyTune 3 puts the control in your hands. The beauty of the PolyTune lies in its ability to get you tuned up with minimal effort. There are three modes to select from: Polyphonic or Chromatic, with a Strobe mode that is exceptionally accurate. The polyphonic tuner allows all six strings to be tuned simultaneously by simply strumming them all at once and making your adjustments accordingly. Chromatic mode is exceptionally precise with an amazing 0.5 cent accuracy. The Strobe tuner is super accurate and super-fast, enabling you to tune to +/- 0.1 cent tuning accuracy, for times when you truly want to be on point. The PolyTune 3 is so smart that it can even tell whether or not you strike one or more strings. Thanks to MonoPoly, the pedal instantly recognises the strings or strings that you've played and responds with the appropriate polyphonic or monophonic tuning mode. The PolyTune 3 supports a wide array of alternate tunings, as well as capo tunings. So, whether you're playing electric or electro-acoustic with capo up to the 7th fret, you can rest assured that this little beauty has you covered. Though reference pitch is set to the A above middle C (concert pitch), you can change the reference pitch to whatever you desire. Pretty clever, eh? TC Electronic's proprietary BonaFide Buffer is a high-quality analogue buffer, which prevents your tone from sounding flat or losing lustre. The buffer ensures that over long cable runs, or in elaborate signal chains and pedalboards, you tone is given the boost it needs to ensure perfectly preserved tone. In buffered mode, there is an additional "always-on" setting available. 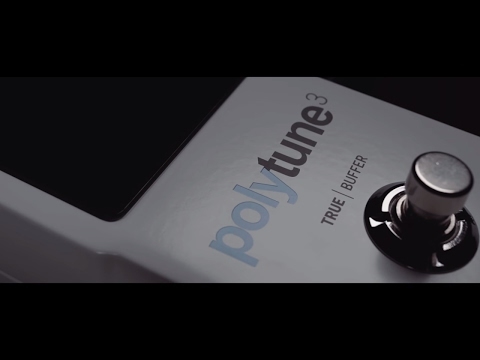 Therefore, the PolyTune 3 is in full operation, even when your guitar's signal is not muted. Wherever you're performing, from a practise room to the studio, from a tiny club to a stadium stage, the PolyTune 3's super-bright 109-LED display guarantees optimum visibility at all times. The built-in ambient light detector responds efficiently to attenuate the brightness level of the display according to your environment. Whether you're an amateur of a professional, the TC Electronic PolyTune 3 guitar tuner pedal with BonaFide Buffer is a must-have for any discerning guitarist's pedalboard.